Dyer often mindlessly repeats all manner of misleading science about global warming, but this time he gives the science a staunchly moral cast. Well, how else to instil a proper sense of guilt? The standard climate change predictions said people in the tropics and the sub-tropics would be badly hurt by global warming long before those living in the temperate zones felt much pain at all. That was unfair, because it was the people of the rich countries in the temperate zone – North America, Europe and Japan, mainly – who industrialised early and started burning large amounts of fossil fuel as long as two centuries ago. That’s how they got rich. Their emissions of carbon dioxide over the years account for 80 per cent of the greenhouse gases of human origin that are now in the atmosphere, causing the warming, yet they get hurt least and last. 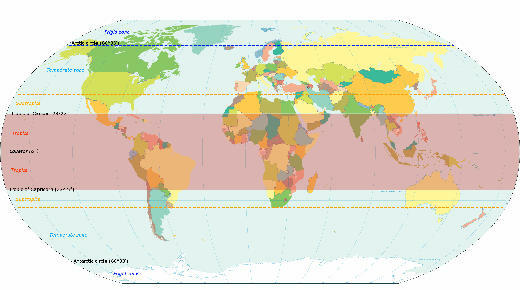 World map indicating tropics and subtropics. Click for full-size version. Here’s the first problem with Dyer’s tirade: dividing developed and undeveloped humanity between temperate regions on the one hand and tropical and sub-tropical regions on the other does not reflect reality. What of South Africa and Australia? What of at least half of China, living, apparently “developed”, in the temperate north — and is that fully a quarter of the USA languishing in the “undeveloped” sub-tropics? People in the rich countries (see, they were already rich — a dreadful crime to the left) “industrialised early”. Well, they had a long, proud tradition of reason and objective inquiry which allowed them to discover important things in the world around them. They developed machines and processes nobody could understand who had no proper education. So the rich countries’ industrialisation was “early” — but that just means “first”. The Europeans made the breakthroughs — North America and Japan had nothing to do with those. Coal was the almost magical fuel that powered the Industrial Revolution and made the world so envy the new technology they searched eagerly for their own black deposits. Still, it wasn’t the fuel-burning by itself that made the Europeans rich (or driving cars would make us all wealthy), it was understanding how to build machines that could use the energy thus released for productive purposes. It was a time of awe-inspiring invention, rapid change and confidence. From mining to metallurgy, from chemicals to crucibles and from trains to telescopes, the studious, self-disciplined and inquisitive men trained in the universities of Europe raced ahead of the old technology. Advances quickly followed in health, agriculture, transport, pharmacology, architecture and so much more. A mere two hundred years later lifetimes have tripled, incomes have soared and mass passenger transport now ignores cruise liners and includes jet aircraft. Wait a minute. How much warming have we caused? Well, first, the IPCC estimates (it can’t calculate, it can only guess) that over about the last 100 years, global temperatures have risen by about 0.6°C. Second, of the CO2 in the atmosphere, how much did we put there? I’ve seen figures ranging between 0.001% and 30%. If we accept the higher figure of 30%, then our share of the 0.6°C temperature rise is 0.3 × 0.6 = 0.18°C. Finally, Dyer claims that the “rich” nations are responsible for only 80% of the man-made CO2 in the atmosphere, so the wealthy people have caused 0.18 × 0.8 = 0.144°C. This amount of warming cannot be detected but everyone ought to thank us for very slightly ameliorating the chill of every frosty morning. Of course, if our share of increased airborne CO2 is only 0.001%, we can expect their gratitude to be somewhat cooler. Frankly, when we manage to quantify what idiots like Mr Dyer are blathering on about, it’s quite hard to understand why we listen to them. The people of the temperate zones are going to get hurt early after all, but not by gradual warming. Their weather is going to get more and more extreme: heat waves, blizzards and flooding on an unprecedented scale. Nasty stuff from a mean-spirited, narrow-minded Luddite. But does he mean it? On an unprecedented scale? Really? He offers no evidence for this and that is because there is none. Heat waves – SPM: It is very likely that the length, frequency and/or intensity of warm spells, or heat waves, will increase over most land areas. Snowfall – SREX: Note that we do not distinguish between rain and snowfall (both considered as contributors to overall extreme precipitation events) as they are not treated separately in the literature, but do distinguish changes in hail from other precipitation types. Flooding – SPM: Overall there is low confidence at the global scale regarding climate-driven changes in magnitude or frequency of river-related flooding. The IPCC does not say heat waves will be “unprecedented”. It does not mention blizzards, but lumps snowfall in with rain. Dyer cannot pretend to predict more blizzards when the world authority finds it too difficult. The IPCC predicts neither increased flooding nor “unprecedented” flooding (unless it’s unprecedentedly small). Next, Dyer looks at a single northern hemisphere winter. He’s quite disturbed that such extreme cold is being caused by severe warming — and so would I be, if I could believe it. But I don’t believe anyone who claims that extreme cold is caused by extreme warming because it is quite stupid. Dyer cites the wintry weather in three places as though it reflects global trends. But during 2013 we had record high and low temperatures in both hemispheres. Every year, numerous places around the world report record warmth and record cold. Different places, usually. Dyer mentions only whichever sort bolsters his argument, but lots of us see the bias he exhibits. He then cites something he calls “abrupt climate change.” Apparently this involves numerous elements and it must be faster than the usual climate change — but that’s just a guess. Here’s his scientific description of abrupt climate change. In Britain, it’s an unprecedented series of great storms blowing in off the North Atlantic, causing disastrous floods. In the United States and Canada, it’s huge blizzards, ice-storms and record low temperatures that last much longer and reach much further south than normal. The extreme weather trend in North America and Europe is less than five years old, so the science that might explain it is still quite tentative. The first hypothesis that sounded plausible, published in 2012 in Geophysical Letters, blamed a slowing of the northern polar jet stream. So storms, floods, blizzards, ice storms and low temperatures are “abrupt climate change”? Well, no, they’re weather, Mr Dyer. Please don’t embroider the truth. They’re also caused exclusively by CO2, apparently ours. You remember? 0.6 of 30%, etc.? Accomplishes quite a bit, that small fraction. Oh, he claims there’s an “extreme weather trend” in North America and Europe, only it’s less than five years old! He hasn’t heard about the standard averaging period of 30 years for climate. It’s been in the news lately in connection with the last 17 years (or more) lack of global warming. So the period of observation is much too short to conclude a “trend” of increased extreme weather, but as well as that, numerous papers in recent years have found no evidence of increase. Here’s one: Fluctuations in some climate parameters, published in the Journal of Atmospheric and Solar–Terrestrial Physics, Volume 73, Issues 7–8, May 2011, Pages 805–809. Interesting tactic, to describe the science “that might explain it” as “still quite tentative.” Sorry, rather than ‘interesting tactic,’ I should say ‘deceitful behaviour’ because it presents as science what can only be either a guess or an agenda. Less than five years!? Clutching at straws, this one. The rest of his pseudo-science is not worth reading until he provides the magnitudes of the factors he cites as producing this “increasing trend” in extreme weather (which doesn’t exist). Factors he conveniently fails to quantify include the Arctic warming trend, the temperature difference between the Arctic air mass and the air over the temperate zone, and the actual speed reduction of the northern jet stream. It must be satisfying indeed for Dyer to ascribe all these diverse weather events to a single jet stream, altered solely by our wicked emissions of climate-changing carbon dioxide. I just wish the mechanism was easier to follow. Hence the “polar-vortex” winter in North America this year, the record snowfalls in Japan in 2012 and again this winter, the heat waves in the eastern US in 2012 – and the current floods in Britain. Come on, Herald — stop publishing this rubbish. Dyer actually gets paid for spreading those distortions, lies and guesses. How fortunate that debunking them costs nothing. Gwynne Dyer is an independent journalist published in 45 countries [and despised in every one of them – RT]. Dang, correction needed. Did that after midnight. The rate from UofC is 3.2 mm/yr, not 3.1 sorry. But you get the picture. What is the acceleration in mm/yr/yr (mm/y^2) ? SLR rate from UofC: 3.2 mm/yr 1993 – 2013 (20 yrs) constant. SLR rate projection from 1995.5: 5.46 – 6.83 mm/yr by 2040. The time 12:00 o’clock “midday (noon)” cannot be written as 12:00 am, because it cannot be both noon and before noon, because it cannot be both itself and something else, so you’re both wrong, aren’t you? The time 00:00 pm is similarly undefined. Giving a time of 12:00 am or pm is in fact meaningless and certainly produces ambiguity because there’s no natural hint of the meanings you have given. The convention is that we simply say noon or midnight. The two times can even be abbreviated to 12 nn or 12 md to fit computer fields. There’s no need to speak ambiguously. The Waikato Regional Council used 12.00 AM for noon. It was clear to me (unambiguous) and I just copied their data. If you’ve got a bone to pick, pick it with them. Simply resolved by using a 24 hr clock of course. Noon 12:00 hrs. >”Noon 12:00 hrs” – Should be1200 hours (twelve hundred hours). I shared a house with a couple of military guys years ago, one ex-NZ Army/UN Peacekeeper, the other ex-NZ SAS. It was always – “back at eighteen hundred”. Only the ones that can’t calculate acceleration properly. Nope it only looks that way when you don’t know how to calculate acceleration properly and yelling doesn’t make it true. Linear growth means constant, unvarying flow which by definition gives an acceleration of 0. If someone is driving at a constant 50km/h then their acceleration is 0km/hr^2. Obviously. In this case rate (mm/yr) tells us nothing about the underlying acceleration. If you think it is 3.2mm/y^2 though you are deluded. So something like (3.2 mm/yr -1.7 mm/yr)/110yr = 0.0136mm/yr^2 although that is likely to be low because of the periods the initial rates are calculated over. OK that’s a misstatement. I’ll restate it correctly: sceptics are pointing to ZERO acceleration of SLR @ constant rate 3.1 mm/yr or y = 3.2x, a 1st order polynomial (quadratic) and acceleration 0 mm/yr/yr. But as above, AGW (RCP 8.5) requires progressively increasing acceleration at approx y = 4.6429x^2 + 22.643x – 28, a 2rd order polynomial (quadratic) or y = -0.8333x^3 + 12.143x^2 + 2.9762x – 14, a 3rd order polynomial (cubic) by approximation of IPCC model projection. But the IPCC models require accelerating acceleration (a curve) anyway as above (RCP 8.5) y = 4.6429x^2 + 22.643x – 28 or y = -0.8333x^3 + 12.143x^2 + 2.9762x – 14 by approximation. >”The rate of SLR is 3.2 mm/yr: http://sealevel.colorado.edu/files/2014_rel1/sl_ns_global.png What is the acceleration in mm/yr/yr (mm/y^2) ?” In this case rate (mm/yr) tells us nothing about the underlying acceleration. If you think it is 3.2mm/y^2 though you are deluded. A better estimate would be using the numbers from here: http://www.climatechange2013.org/images/report/WG1AR5_SPM_FINAL.pdf Page 11. Which gives us some rough numbers: 1.7 [1.5 to 1.9] mm yr–1 between 1901 and 2010 3.2 [2.8 to 3.6] mm yr–1 between 1993 and 2010 So something like (3.2 mm/yr -1.7 mm/yr)/110yr = 0.0136mm/yr^2 although that is likely to be low because of the periods the initial rates are calculated over. Yes, the satellite series as I have used – constant 3.2 mm/yr, zero acceleration. Yes, the tide guage series – constant 1.7 mm/yr, zero acceleration. You CANNOT subtract tide guage from satellite because there’s a 17 year overlap 1993 – 2010 when the satellite rate was constant 3.2 mm/yr and the tide guage rate was constant 1.7 mm/yr simultaneously, neither of which accelerating in that 17 years. E.g. flow growth rate 0.225 mm/yr, and flow acceleration rate 0.225 mm/yr/yr. Obviously flow growth rate must be added to the initial flow rate (b or u) to get flow rate each time step using y =mx +b and v = u + at. So Yr2 velocity is 8.326 (8.325 = 8.1 + 0.225 x 1). Flow rates are then Yr1 8.1, Yr2 8.325, and so on to 9.9. Carries on from this thread. Flat Rate (3.2 mm/yr) each year is: 3.2, 3.2, 3.2, 3.2, …………zero acceleration. It updates the model to 2002 to 2012, removes some extraneous stuff and updates error calculations. The sensitivity of co2 to ambient temperature change is reduced considerably as a result of reading above. The land sea sink are the major unknowns and land sink is used as variable parameter. No average model prediction will ever be anywhere near correct because models are based on an incorrect assumption of isothermal conditions in the absence of greenhouse “pollutants” like water vapour and carbon dioxide. When my book is available late April there will be advertised in Australian media and on websites a $5,000 reward for anyone in the world who can use valid physics to debunk the Loschmidt gravito-thermal effect (on which my hypothesis is based) and produce a similar study to mine which does not show a negative correlation between temperature and precipitation records, but rather one which is in keeping with the implied greenhouse sensitivity of about 10 degrees of warming for every 1% of water vapour in the atmosphere, this calculation being based on a mean of 2.5% water vapour causing 25 degrees of the claimed 33 degrees of warming. The WUWT article about the Loschmidt effect was flawed in that it overlooked the thermal gradient in solids. When you connect a conductor to the top and bottom of a cylinder of gas you create a new combined system. Then a new state of thermodynamic equilibrium (with a thermal gradient based on the weighted mean specific heat of the gas and metal) evolves and perpetual circulation of energy is of course impossible. My four molecule thought experiment clearly demonstrates why the gravito-thermal effect is valid and has set up thermal gradients in tropospheres over the life of planets throughout our Solar System. This occurs by convection, where I use the term as physicists do to embrace both diffusion and advection. Such convection is restoring thermodynamic equilibrium (with maximum entropy) in accord with the Second Law of Thermodynamics. An isothermal troposphere would not be what the Second Law indicates would evolve. All this is a matter of thermodynamics at a level requiring at least a major in physics. Only five out of 29 on the SkS team have such qualifications, as I do also, and Neal King is one of them. You can see how he fumbled on Lucia’s blog and his final post has possibly bluffed you, but it depends on a totally false claim that some molecules accelerate downwards under gravity, whilst he incorrectly claims an equal number decelerate – yes, slow down, when “falling” towards the surface. Climatologists are incorrect in assuming isothermal conditions in tropospheres and even in sealed cylinders. Graeff did at least find some gradient in virtually all his 850 experiments. He got his physics theory wrong, but not his measurements. Advection is measurable net molecular movement which appears to amount to gas flowing over the sloping thermal plane, always in all accessible directions away from any new source of thermal energy which disturbed the previous state of thermodynamic equilibrium. It is not a waste of time to consider the validity of the gravito-thermal effect, because it does away with any need to explain the observed thermal gradients in tropospheres using radiation calculations relating to heated surfaces. Of course you can’t do that for Uranus, because there is no direct Solar radiation or any surface at the base of its nominal troposphere. You need to think outside the sphere that is Earth. The Second Law of Thermodynamics is not a simplistic rule that heat always transfers from warmer to cooler regions if there is a temperature difference. In the early pre-dawn hours the lower troposphere still exhibits the expected thermal gradient, but meteorologists know that convection stops. Yes energy flow stops even though there is warmer air at lower altitudes. That is because there is thermodynamic equilibrium, and when we have thermodynamic equilibrium – well, you can look up in Wikipedia all the conditions and things that happen. The real Second Law of Thermodynamics takes quite a bit of understanding and many hours, maybe years of study. You guys have absolutely no understanding of it, as I can detect from my decades of helping students understand physics. To understand it you have to really understand entropy for starters. Then you have to really understand thermodynamic equilibrium and all the other states, such as mechanical equilibrium, thermal equilibrium etc which the Second Law embraces. That is why, for example, you cannot disregard gravity and gravitational potential energy when determining the state of maximum entropy attainable by an isolated system. If you want to stay in the mid-19th century when much of this physics was not widely understood, and if you want to imagine, for example, that radiative heat transfer does not obey the Second Law, then all I can say is that you must live in a strange and isolated planet, because you sure can’t answer my questions about other planets with your climatology paradigm. When you truly understand the Second Law of Thermodynamics then, and only then, will you start to understand how it explains the so-called lapse rate and how the pre-determined thermal profile supports surface temperatures everywhere, not back radiation from a cooler atmosphere. Thus you will understand why it’s not carbon dioxide after all.